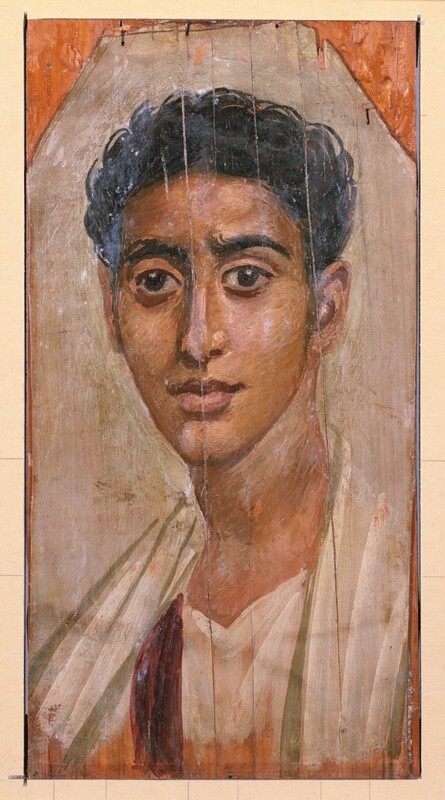 Description In Roman Egypt (30 BCE-324 CE), artists adapted naturalistic painting styles to the ancient custom of making portrait masks for mummies. The portraits were often painted while the subject was in the prime of life and were hung in the home until the person's death. This practice continued in northern Egypt well into the Early Byzantine period. Mummy Portraits from Roman Egypt. The Detroit Institute of Arts, Detroit. 1967. Beyond the Pharaohs: Egypt and the Copts in the Second to Seventh Centuries A.D.. Museum of Art, Rhode Island School of Design, Providence; The Walters Art Gallery, Baltimore. 1989. Provenance Excavated by Petrie, 25 Feb. 1888 at Hawara [later referred to as no. T]; H. Martyn Kennard, London, [date of acquisition unknown], by purchase; Sale, Sotheby's, London, July 16, 1912, lot 541; Henry Walters, Baltimore, 1913, [mode of acquisition unknown]; Walters Art Museum, 1931, by bequest.